It’s TC Film Fest week which makes us think of…food! Movie food that is. 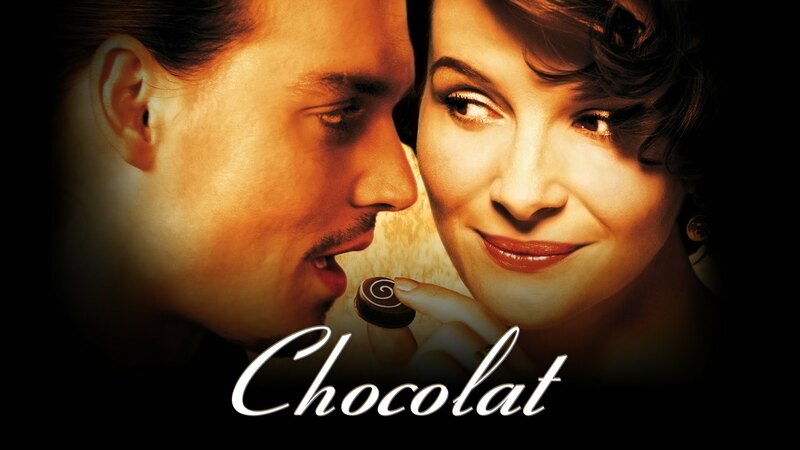 There are so many wonderful food-related movies and memorable food-related scenes, like Babette’s Feast, Big Night, Chocolat, Like Water for Chocolate, to name a few. What’s your favorite food movie or scene? The amount of chile pepper called for in this recipe seems like an awful lot but if you love chilies it’s probably great. In the top of a double boiler, melt the chocolate and butter over medium-low heat. Remove from the heat and whisk in the cocoa, chili powder, and salt. Run a thin, sharp knife around the edge of the cake. Remove the pan sides and gently lift away the cake. Invert onto a cake plate, remove the bottom and peel away the parchment. Serve with whipped cream. Bring cream just to a boil over medium-high heat. Pour over the chocolate, and add salt. Let stand for 10 minutes without stirring. Stir with a whisk until smooth and shiny and all the chips are melted completely. Drizzle over chocolate cake. Season both sides of tomatoes with salt and pepper. Place flour in a shallow dish like a pie plate. In another shallow dish, beat eggs with the milk. In a third dish, mix bread crumbs with paprika. Dredge tomatoes with the flour, dip into the eggs, and then coat with bread crumbs. Heat about ½ inch of oil in a cast iron skillet over medium heat. Fry tomato slices until browned, about 2 minutes. Turn carefully and cook other side. Drain on paper towels. Preheat oven to 400 degrees. Cover pie crust with foil and bake for 10 minutes. Remove foil and bake 5 minutes more. Remove crust and reduce heat to 325 degrees. In skillet, saute ham until brown. Remove and set aside. Saute onion until tender. Remove with slotted spoon and combine with ham. Spread on bottom of pie crust. Spread brie over ham mixture and sprinkle with parmesan. Combine eggs, cream and nutmeg; pour over cheese. Bake 30 minutes or until set. Cool slightly, cut into wedges and serve. Preheat the oven to 400 degrees. Butter a 2-quart gratin or baking dish. Place the sliced vegetables in a large bowl, and season generously with salt and pepper. Add the thyme, and toss together. Arrange the vegetables in the gratin dish. Add the milk, season with more salt and pepper if you wish, and place in the oven on the middle rack. Bake 45 minutes; every 15 minutes, press the vegetables down into the milk with the back of your spoon. Mix tomatoes, basil, and garlic together and season with salt and pepper. Heat olive oil in a skillet over medium heat and fry bread until golden brown on both sides. Remove and drain on paper towel. Spoon tomato mixture onto toasts and serve immediately.